Four-time winner in the last six editions, actual no. 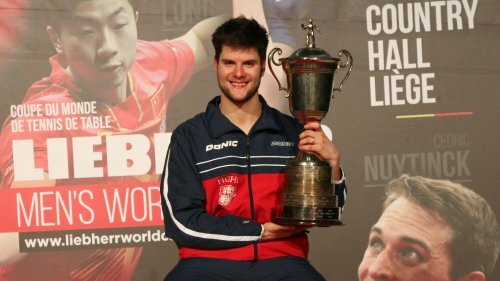 2 seed Dimitrij OVTCHAROV shares third place (with Vladimir SAMSONOV) at the All-time winners list of Europe Top 16, behind Jan-Ove WALDNER (seven titles) and Timo BOLL (six). The 30-year-old German, 2018 runner-up, is aiming his fifth crown at the 2019 CCB Europe Top 16 Cup, to be held this Saturday and Sunday (February 2-3) in the Swiss city of Montreux. How is your current preparation for the 2019 CCB Europe Top 16 Cup? How do you see the list of 2019 favorites and your chances to get new Euro Top 16 crown? You managed to collect four titles in last six editions of Euro Top 16. What is the common thing for all these titles, something that drove you to the titles? Your personal goals in 2019? In men’s singles will play: Timo BOLL (Germany), Dimitrij OVTCHAROV (Germany), Mattias FALCK (Sweden), Liam PITCHFORD (England), Vladimir SAMSONOV (Belarus), Jonathan GROTH (Denmark), Simon GAUZY (France), Kristian KARLSSON (Sweden), Marcos FREITAS (Portugal), Emmanuel LEBESSON (France), Daniel HABESOHN (Austria), Tiago APOLONIA (Portugal), KOU Lei (Ukraine), Ovidiu IONESCU (Romania), Panagiotis GIONIS (Greece), Lionel WEBER (Switzerland). Women’s Event: Sofia POLCANOVA (Austria), Bernadette SZOCS (Romania), Elizabeta SAMARA (Romania), LI Jie (Netherlands), Petrissa SOLJA (Germany), Matilda EKHOLM (Sweden), LI Qian (Poland), Georgina POTA (Hungary), Britt EERLAND (Netherlands), Polina MIKHAILOVA (Russia), NI Xia Lian (Luxembourg), Nina MITTELHAM (Germany), Natalia PARTYKA (Poland), Hana MATELOVA (Czech Republic), Barbora BALAZOVA (Slovakia), Rachel MORET (Switzerland). CCB Europe Top 16 Cup is going to be covered (replay or delay) by Eurosport 1 and Eurosport 2. Table Tennis fans can enjoy watching their favourite sport on TV within two days, February 3rd (Eurosport 2, 18:45 - 20:10 delay) and February 4th (Eurosport 2 - 13:00 – 14:00 reply, Eurosport 1 – 16:45 – 17:30 reply). CCB Europe Top 16 Cup will be shown in total of 54 countries. They are following: Albania, Andorra, Armenia, Austria, Azerbaijan, Belarus, Belgium, Bosnia and Herzegovina, Bulgaria, Croatia, Cyprus, Czech Republic, Denmark, Estonia, Finland, France, Georgia, Germany, Greece, Hungary, Iceland, Ireland, Israel, Italy, Kazakhstan, Kosovo, Kirghizstan, Latvia, Liechtenstein, Lithuania, Luxembourg, Macedonia, Malta, Morocco, Moldova, Monaco, Montenegro, Netherlands, Norway, Poland, Portugal, Romania, Russia, San Marino, Serbia, Slovakia, Slovenia, Spain, Sweden, Switzerland, Turkey, UK, Ukraine, Vatican.